When Frenchie Davis was kicked off of Idol for appearing on an adult website she got an offer to join the cast of Rent, then in its 7th year. People knew her name and came to see her, as if she were a star. Stunt casting? They capitalized on her name to sell some tickets. It’s been going on for years on Broadway. When Toni Braxton was down on her luck, Disney picked her up and dropped her into Beauty and the Beast (and dropped the keys of the songs). She was a star and people came to see her. So what’s the difference? These days the definition of a “star” can simply be someone you’ve seen on television over and over again. In the ‘90s it was John Tesh, now it’s anyone who’s been on American Idol. Simon Cowell dismisses contestants as “too Broadway,” but Broadway can’t dismiss reality TV so easily. American Idol “stars” are all over the place: Diana DeGarmo in Hairspray, Clay Aiken in Spamalot, Fantasia Barrino in The Color Purple, Taylor Hicks in Grease, and Constantine Maroulis in Rock of Ages. Tamyra Gray has been in both Bombay Dreams and Rent. And she was good! When Josh Strickland was cast as Tarzan, all of the news stories included the fact that he was a national finalist on AI. Yes these people all started out on Idol, but they wouldn’t have made it on Broadway if they didn’t have the talent to back it up. Soon producers went a step further. It was no longer enough to take the cast offs from television. Why not create your own star? London’s How Do You Solve A Problem Like Maria? was the first show to use a television competition to cast a musical. The series was a huge hit when it debuted on the BBC in 2006. It made a star out of Connie Fisher, and The Sound of Music opened with the largest advance ticket sales in London theater history. It was such a sensation that even the runner-up, Aoife Mulholland (also known as “Irish Maria”), was cast in the West End production of Chicago. Here in the U.S. we’ve had Grease: You’re the One That I Want and Legally Blonde the Musical: The Search for Elle Woods. The Grease show was basically an hour-long commercial seen by 8 million viewers a week. The revival opened on Broadway with a $14 million advance, making Broadway stars out of Laura Osnes and Max Crumm, and ran for almost sixteen months. That’s not a huge run when you look at shows like The Lion King or Phantom of the Opera, but considering that there had already been a revival of Grease a few years back, it did respectable business. Osnes is now taking over the role of Nellie Forbush from Tony Award-nominee Kelli O’Hara in the Lincoln Center Theater revival of South Pacific. Legally Blonde, the TV show and the musical, didn’t have the same luck. The reality show ran for 8 episodes on MTV. Bailey Hanks took over the pink reins in July and the show closed in October. The problem with these reality shows is that there is no reality in them. The audition process and performances are both so contrived. Auditioning is stressful enough; show that part of it. On the other side of the coin, the people who get down to the wire actually do have talent. Many of them are told to mask their performance history to make it look like they are being “discovered” on TV. There’s also the entertainment factor. When you see a plus-size Sandy or a 40-year-old Danny it’s not a far cry from the early American Idol audition of William Hung. So far we’ve been spared the horror of other reality TV stars coming to Broadway. Can you imagine The Apprentice’s Amarosa as Nala in The Lion King? Or Janice Dickinson as The Drowsy Chaperone? Okay. Maybe that one could work. And we are still creating our own stars on Broadway. For every Frenchie Davis there’s an Audra McDonald. For a Diana Degarmo coming from television, there’s a Kristin Chenoweth going to television. The bottom line is American Idol stars help out at the box office. They can boost sluggish ticket sales and give a show another angle and story to pitch. Do we want to keep seeing Broadway being cast from television? Not really. When they take Lauren Graham out of Gilmore Girls and put her into Guys and Dolls, it’s not all that different. At least with American Idol’s cast-offs we already know they can sing before we get to the theater. at Broadway Cares Equity Fights AIDS ( bcefa.org). 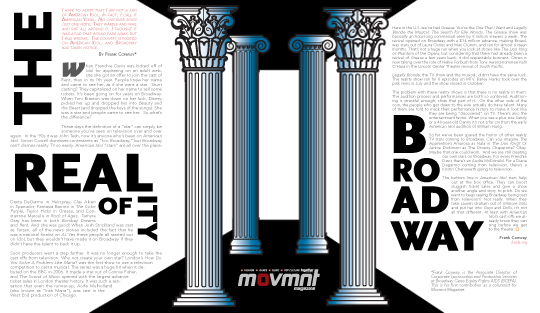 This is his first contribution as columnist for Movmnt Magazine.